Looking back over the games I've played for my site over the last seven years, I've noticed a pattern forming: I've played a horror game for Halloween on every odd-numbered year, while even-numbered years have gotten games like Snake's Revenge and Saints Row IV at the end of October instead. 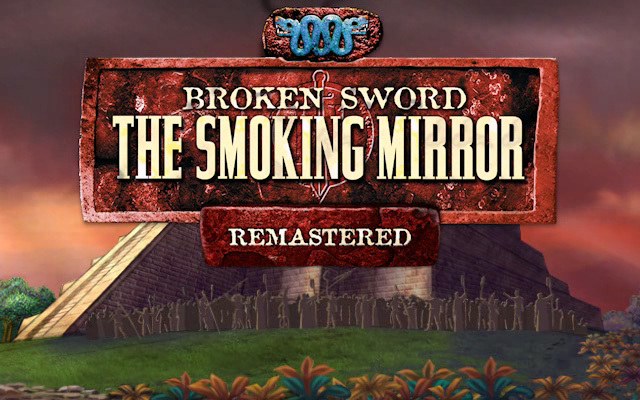 Seems to me that I've got a bit of a tradition forming here... but I despise pointless traditions, so this year on Super Adventures I'm breaking the pattern by playing Broken Sword: The Smoking Mirror - Remastered! I don't think I'll be seeing any ghosts or zombies in this one. I'm torn here, because I really want to call it Broken Sword II, but there's clearly no 'II' in that logo up there. There was in the original game's logo, but they've taken it away for the Remastered version, because I guess knowing what order things go in only confuses modern audiences. Personally, I'm more confused by the subtitle. Is it referring to a mirror that's recently been used as a murder weapon? A mirror people that go out to when they fancy a quick smoke? Wait, I forgot to mention that I'm playing the game on Halloween because it was released on October 31st, 1997, the same day as Curse of Monkey Island and the Blade Runner adventure game, so all three are twenty years old today! Well okay, technically this is only seven years old because I'm playing the Remastered version on Steam. I would've played my original CD version but I've lost it. I've checked shelves, I've checked boxes, I've checked other boxes buried underneath boxes, and it seems like the bloody game's just vanished. Funny thing is, when I bought the game the discs were already damaged and some of the video files wouldn't copy when I installed it. Fortunately, when ScummVM came out there was a compatibility problem with the video codec so Revolution put revised cutscene files up for free and I could finally play this game I'd owned for years! I actually still have that install on my hard drive ready to go, but I lost half the files in a hard drive failure and now ScummVM won't even recognise it. It's like fate doesn't want me to play this game, and it doesn't care how much physical storage media it has to break to keep me from it.